Formwork Placing tools - Walls extension is now placed under Concrete in Applications & Components -dialog. 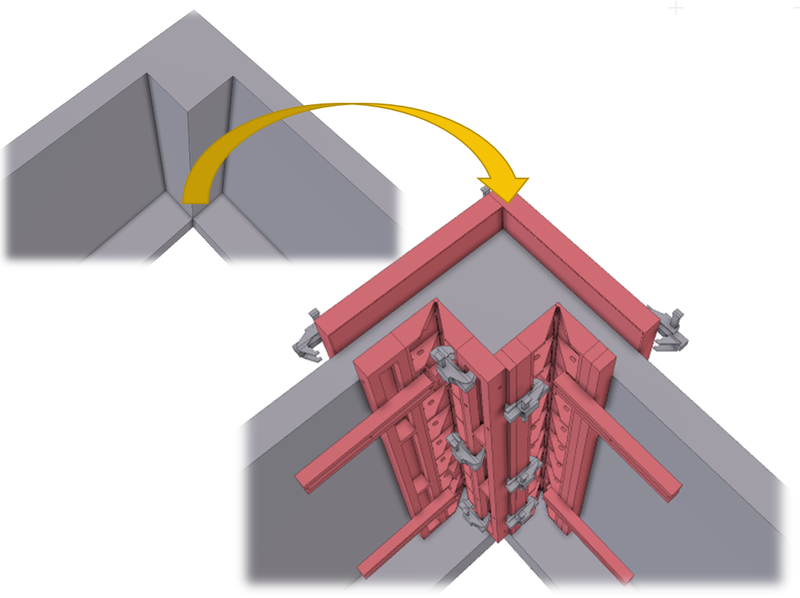 The main tool Formwork wall panel is clearly visible and sub-tools can be found from Sub-tools -folder. In some cases it was possible to inadverently snap trough formwork panels and concrete to the formwork on other side of the wall. 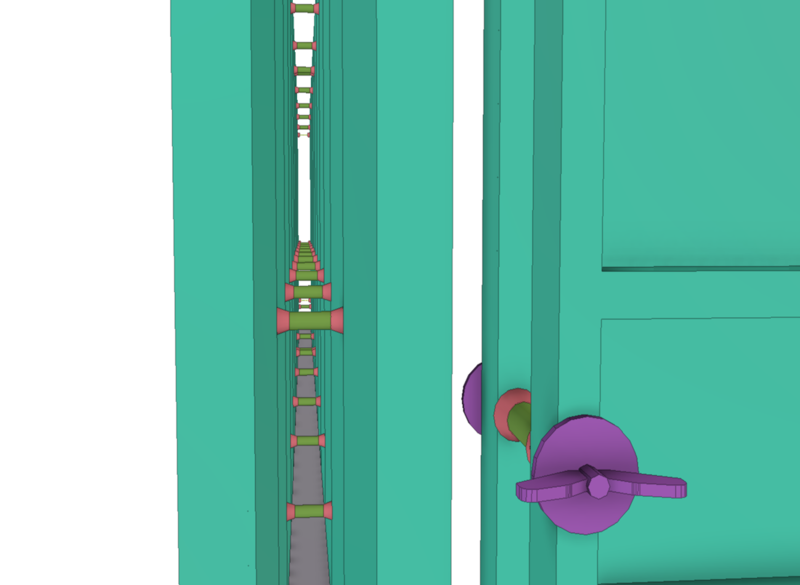 This has now been fixed and the tool snaps only to formwork panel faces closest to the viewer. 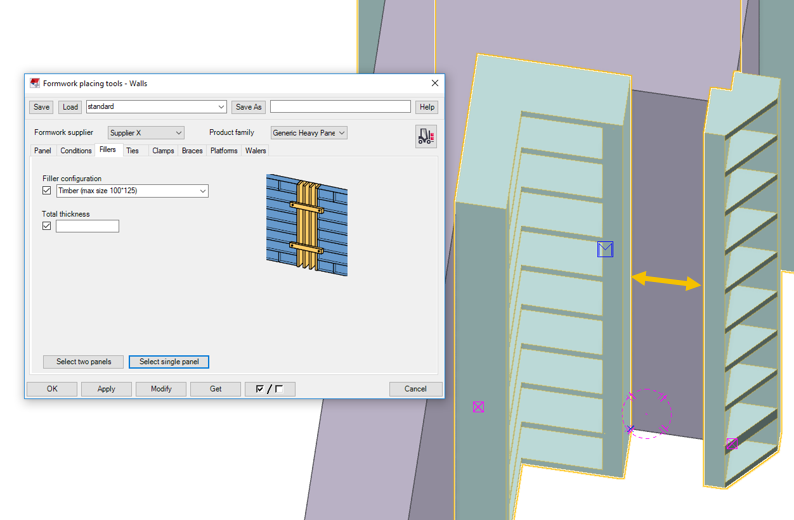 When picking the attachment point for top end of a brace, in stacked panel layout, the tool now automatically recognizes the lower panel in stacked panel layout. The bottom end of a brace goes all the way down and strut attaches to the lowest panel in a stacked panel layout. The tool is now able to place panels with any width. Previously panel minimum width was limited to 250 mm. Placing the panels works now also in the plane view. Previously the direct modification of pouring platforms was not working correctly when environment was using imperial units. This has now been fixed. 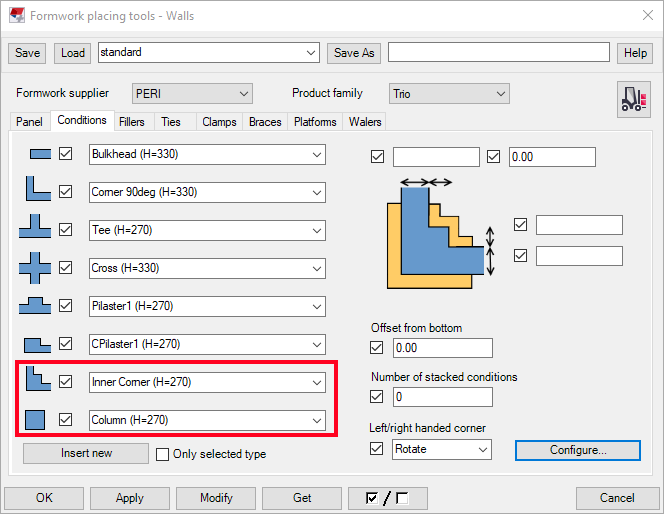 Wall panel and corner layouts can now be copied and mirrored. Note that the accessories (clamps, ties, braces etc.) are not copied or mirrored. New configuration file "***.FormworkTools.Walers.csv" has been added. Tool has now automation for clamp direction. 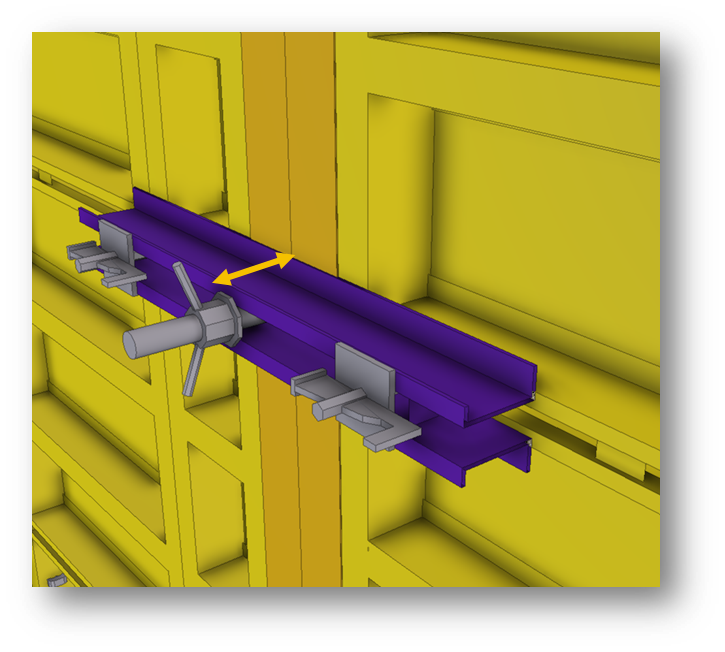 When clamps are inserted into panel array the tool automatically inserts clamps to correct rotation. Earlier user needed to pick the direction (order of red and green preview boxes) correctly or clamps were added upside down. Tool has now automation for condition direction. 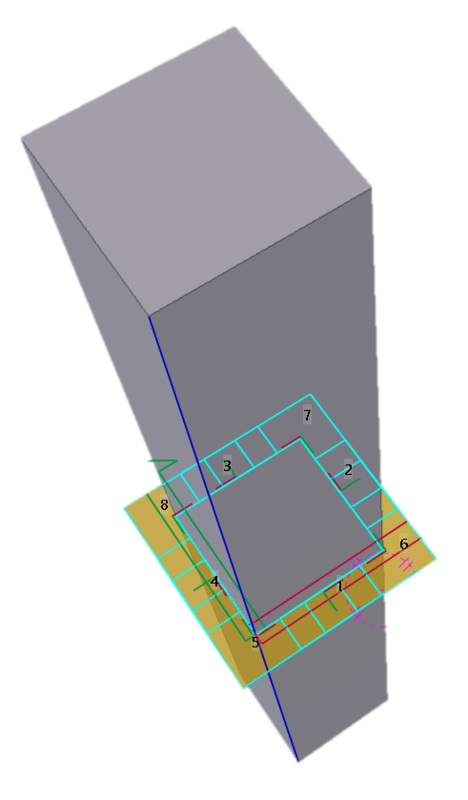 Formwork Placing tool – Walls supports now two alternative methods of entering conditions: rotate (around z) and mirror. Earlier user needed to select the direction by hovering mouse to correct location. The direction was indicated with red and green lines but this wasn’t very intuitive because it was impossible to know which order was the correct one other than remembering it by heart. New configuration file "***.SubAssemblyItems.ini" has been added. The file allows users to define multiple methods how the Conditions should behive when they are mirrored. Preset and picking points of braces have been separated. Previously it was only possible to insert single braces into preset locations. This wasn’t resulting good usability so now these two can be defined separately. It’s also possible to snap to picking points when editing the brace. New fields (BracePickX, BracePickY, BracePickXY, BraceTiltedPickX, BraceTiltedPickY, BraceTiltedPickXY) have been added to "***.FormworkTools.Panels.csv". Preset and picking points of ties have been separated. Previously it was only possible to insert single ties into preset locations. This wasn’t resulting good usability so now these two can be defined separately. It’s also possible to snap to picking points when editing the tie. New fields (TiePickX, TiePickY) have been added to "***.FormworkTools.Panels.csv". Preset and picking points of clamps have been separated. Previously it was only possible to insert single clamps into preset locations. This wasn’t resulting good usability so now these two can be defined separately. It’s also possible to snap to picking points when editing the clamp. New fields (ClampPickX, ClampPickY) have been added to "***.FormworkTools.Panels.csv". Bulkheads have now end offset to make it easier to model timber infill. Platform functionality has been improved to support custom arrays. This means that it’s now possible to move individual supports to new locations within the platform array. 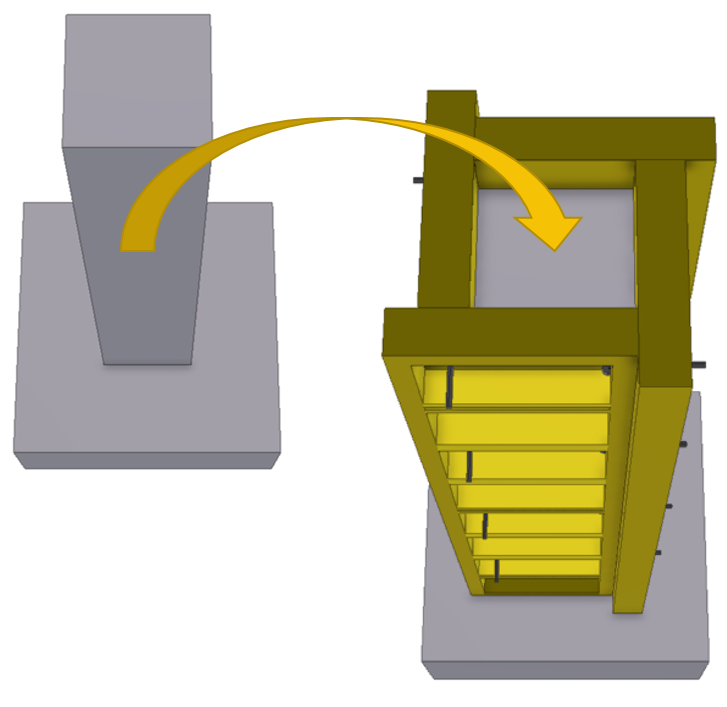 Small chamfers are now ignored in formwork placing. This will make modeling easier because the tool does not try to rotate panels based on chamfers. Ties support 1500mm thick walls. Previously support was limited to 500mm. The wall thickness haven’t been set to infinity because the tool searches for opposite panel and performance will be better when the search range is limited. 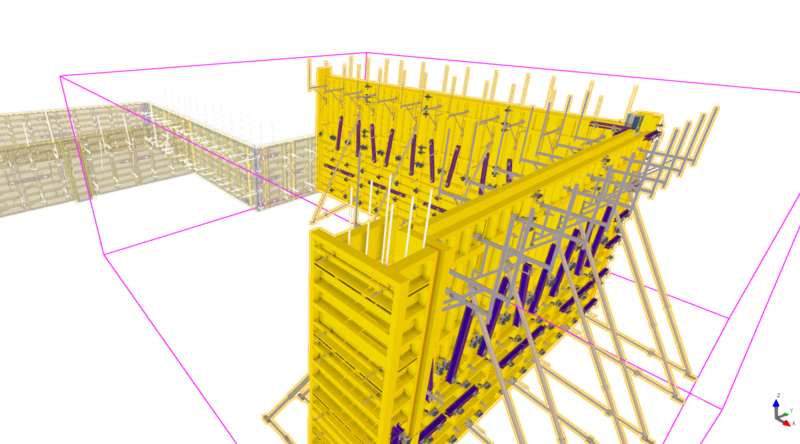 Name of MaxLength field has been changed to MaxWallThickness in "***.FormworkTools.Ties.csv". Ties support now automatic selection based on length of the tie rod. 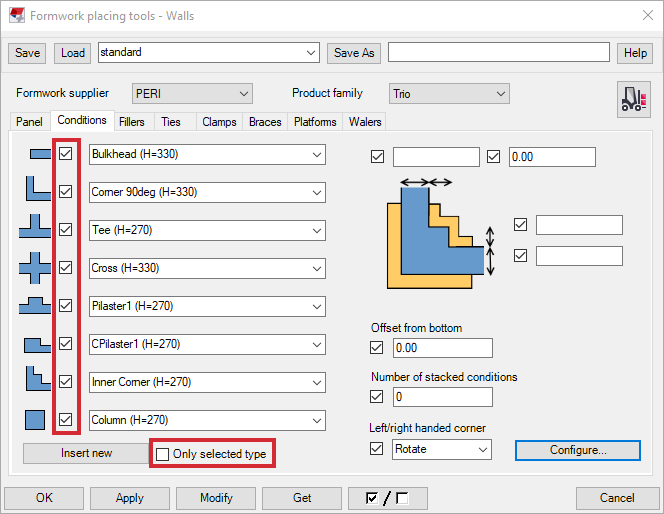 This means that now it’s possible to create settings that select correct ties automatically based on wall thickness. 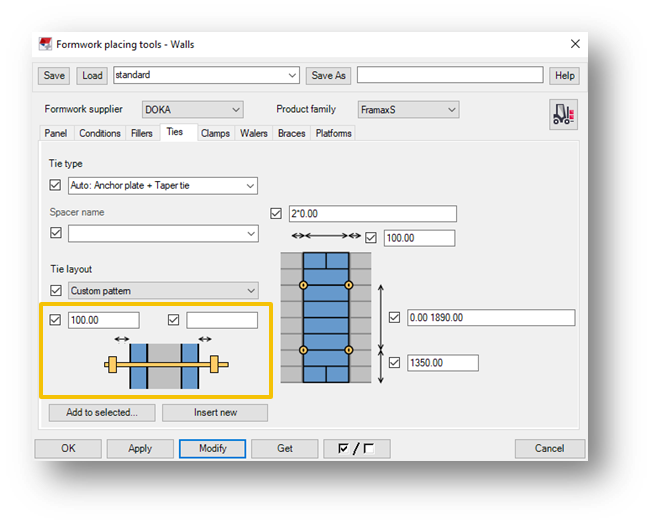 If multiple ties has defined with same name the tool selects correct one based on MaxWallThickness value. Ties can now be added into fillers. 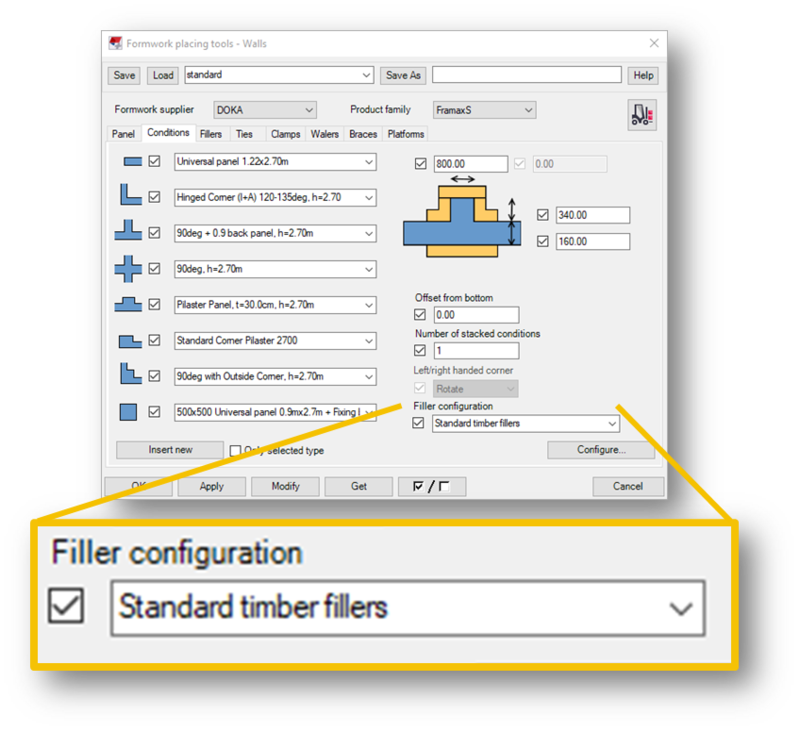 Preset or picking points of filler ties can’t be added to configuration files but it’s possible to save used settings using the dialog and reuse them later. 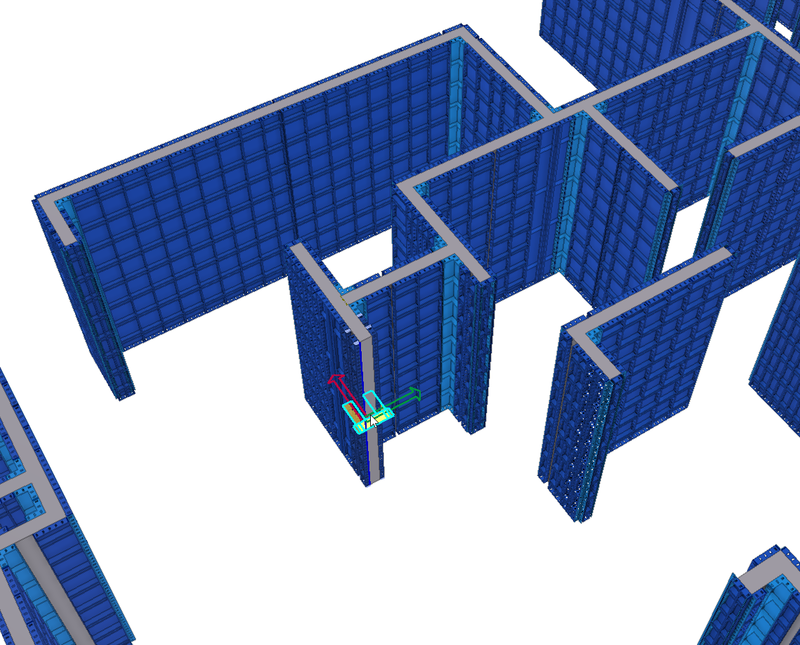 It’s now possible to add contour plates, polybeams, items and any components into Conditions. Earlier only beams, custom parts and Fillers has been supported. 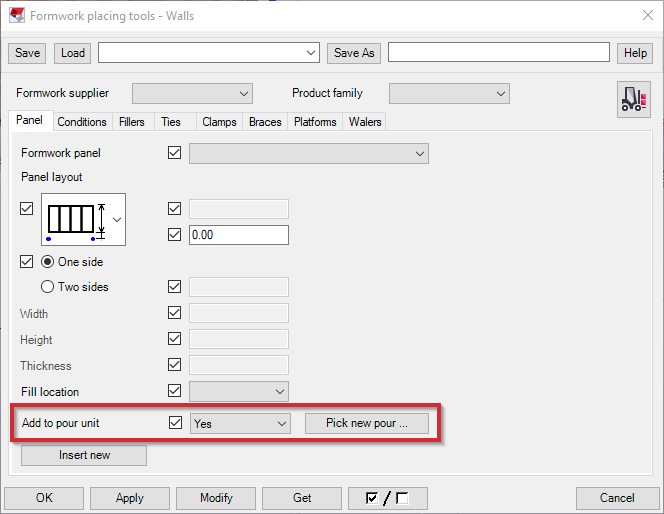 “Insert new” button has been added to FormworkPanel dialog. Braces can be now attached to tilted panels. New fields (BraceTiltedX and BraceTiltedY) have been added to "***.FormworkTools.Panels.csv". Length calculation of lower brace has been fixed so that it works also when upper brace haven’t been inserted. This means that now it’s possible to add lower brace to lower panel with 1500mm offset and upper brace to upper panel with 1500mm offset and the both braces will meet in same location. Automatic brace selection based on length has been revised. Earlier the length took only upper brace into account. Now lengths of both (upper and lower) braces are checked in calculation. This will result as more robust automatic brace selection and easier manual modification of braces. If multiple braces has defined with same name the tool selects correct one based on MinLength and MaxLength values. Brace connection point can now be moved (dragged) vertically also. This can be done by pressing down “Atl” key and dragging the handle to new location. Without pressing “Alt” key the handle is moved horizontally. Clamps can now be added to array of one panel. Earlier array must have contained at least 2 panels to support clamps. Insert new buttons work now on US imperial, US metric, France and customers own environments. Earlier the installation added macro files to common environment. This has now been changed that the macros are created runtime when they are needed and not stored on hard drive. 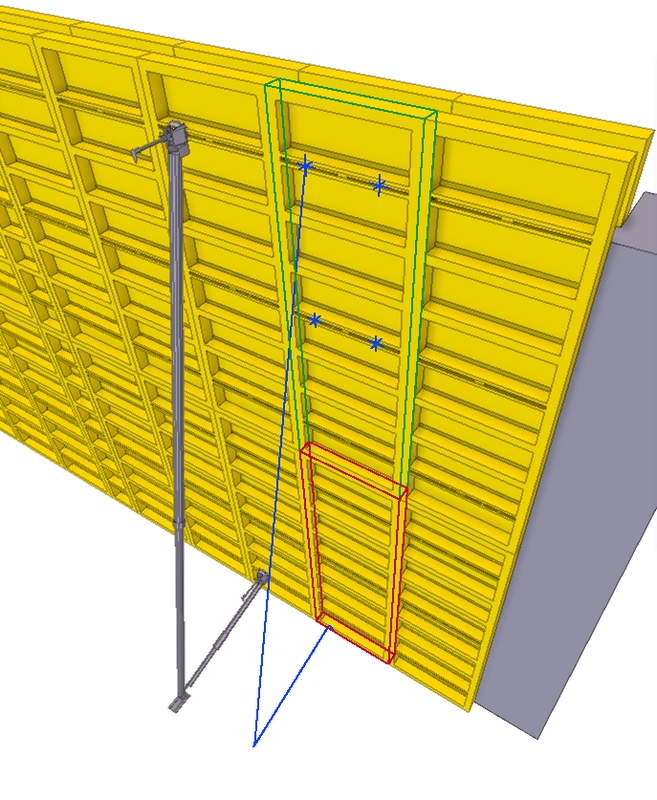 MaxLength field has been changed to MaxWallThickness in Formwork Placing tools – Walls 2.0. We have implemented support to both field names for version 2.0. In some cases corner subassemblies of Bulkheads had wrong elevation. This is now fixed. Tool will now inform users if some components are not included into the model which are defined in settings. Numerous improvements to translations and better error/exception handling. Apply to selected button has been hidden from Conditions. It wasn’t working as well as we desired. Dropdown fields show more characters now. The new example has been created. All old settings has been revised and new features has been taken into account. The configuration now uses only formwork items from Framax S family. 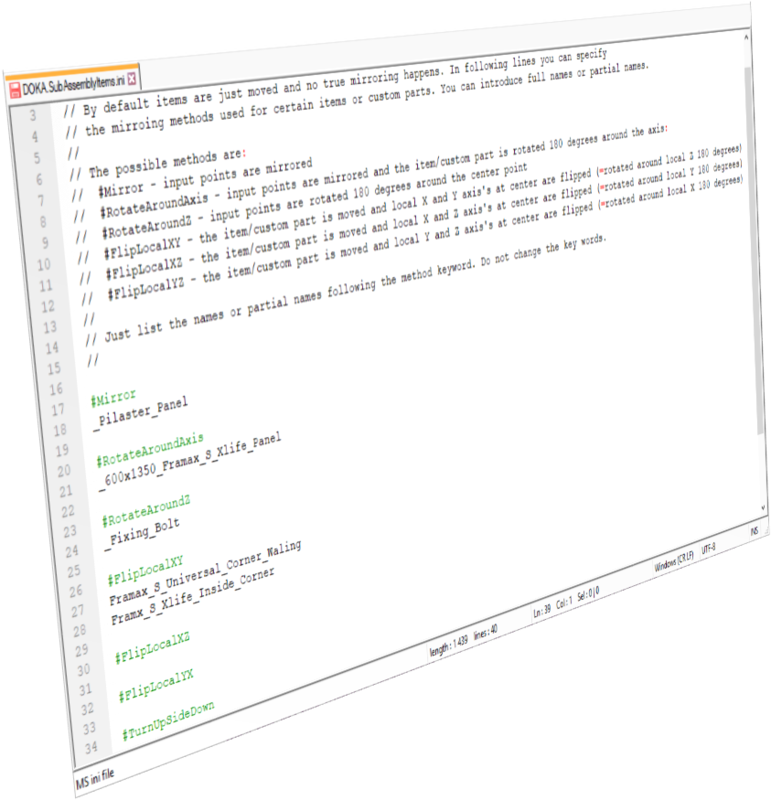 It's good to review these files if you are planning to create your own configuration. • Insert new buttons work now on US imperial, US metric, France and customers own environments. Earlier the installation added macro files to common environment. This has now been changed that the macros are created runtime when they are needed and not stored on hard drive. • It’s now possible to add contour plates, polybeams, items and any components into Conditions. Earlier only beams, custom parts and Fillers has been supported. 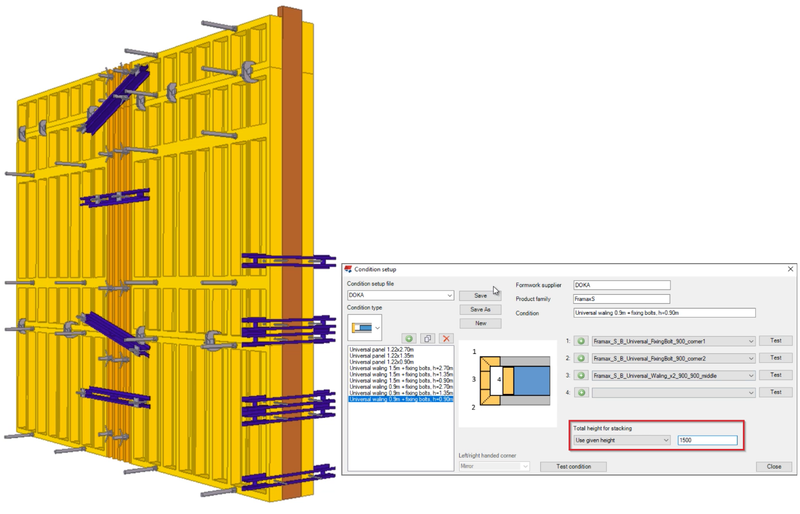 • MaxLength field has been changed to MaxWallThickness in Formwork Placing tools – Walls 2.0. We have implemented support to both field names for version 1.3 also. • Apply to selected button has been hidden from Conditions. It wasn’t working as well as we desired. Fixes issue "Sometimes the tool fails to read in the standard file of the component that will be placed to the model. Standard file can be manually loaded after the insertion." New attribute “***InputOrder” added. 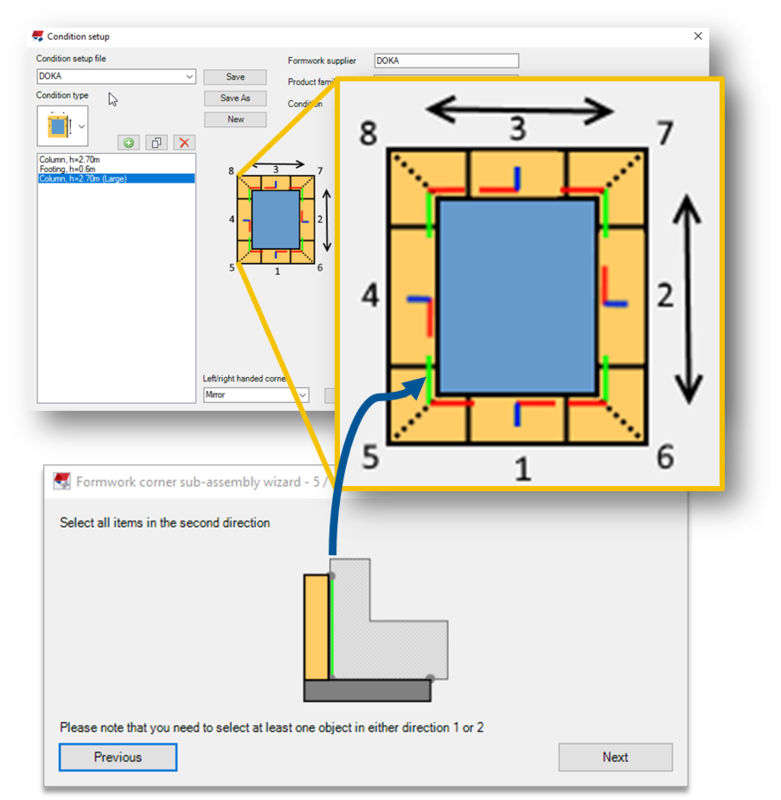 This offer flexible way to control input points of the components. Sometimes the tool fails to read in the standard file of the component that will be placed to the model. Standard file can be manually loaded after the insertion.